The LX Keyboard Arm mounts keyboards to any wall while providing vertical and side-to-side motion. 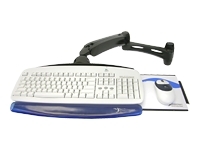 Effortlessly place a keyboard to the most comfortable typing position, seated or standing. When not in use, simply push the keyboard and fold it up to within 4.6" of the wall. This is the perfect accessory for space-constrained areas. Pair it with an LX LCD Arm to create a complete workstation.